NB: Special thanks to Greg Theoharis and Ben McAleer for their valuable contributions to this article. Harry Kane, 21-years-old, 29 goals in all competitions, 4 assists and the Premier League Young Player of the Year Award. What more is there to say? The Tottenham forward has enjoyed the most productive season of any Englishman, young or old. He was something of an unknown entity at the start of the campaign, having only shown glimpses of his ability under Tim Sherwood in 2013/2014. However, Kane quickly became one of the most clinical forwards in the Premier League under Mauricio Pochettino. 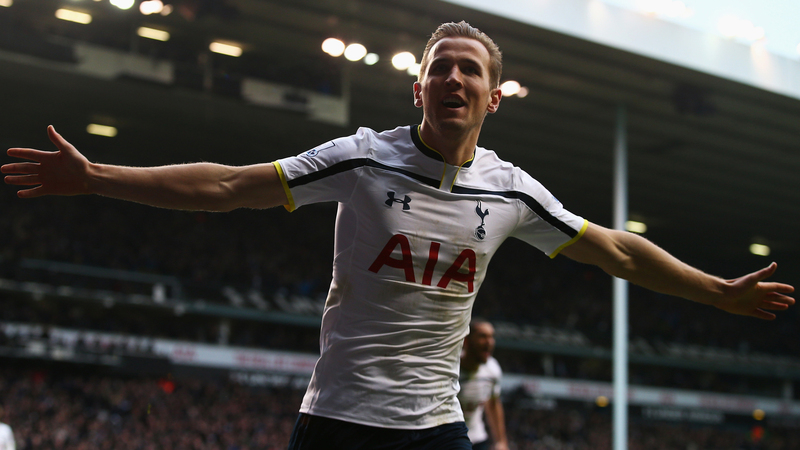 In 2014/2015 Kane has doubled his total career goals tally registering 21 goals in the Premier League alone. The striker has caught the majority of football fans and pundits completely unawares, establishing himself as Pochettino’s main striker and Tottenham’s best and most consistent player this season. Spurs fan and curator of the popular football website, Dispatches From A Football Sofa, Greg Theoharis spoke to me about Kane’s breakthrough. His emergence this season has gone some way to filling a Gareth Bale shaped hole in the Spurs side: “For much of last season, Spurs were lacking a hero and although Kane isn’t blessed with the Welshman’s ability to cut through a defence in thrilling fashion and at high speed, he more than makes up for it in courage, heart and a willingness to work hard. Kane has led the line for Spurs with swashbuckling gusto and a fearlessness that simultaneously exhilarated Spurs fans and captured the attention of football fans up and down the country. With Emmanuel Adebayor and Roberto Soldado both misfiring, Kane effectively became the first name on Pochettino’s team sheet. He consistently found the back of the net and in the big games too. Two goals and an assist in the 5-3 victory over Chelsea showed Kane had the ability to not just cope, but thrive under pressure at Spurs. For his first goal, Kane cut through the Chelsea midfield with a powerful and direct dribbling run before stroking the ball into the bottom corner of the net from the edge of the area. His second was just as good, receiving the ball from the wide left, rolling Nemanja Matic with a sublime first touch before curling the ball into the bottom corner again. It was a complete performance from the forward which no doubt gave Gary Cahill and John Terry nightmares for weeks. WhoScored.com’s, Ben McAleer also spoke with me about Kane’s impressive season, agreeing that it was Kane’s work rate and desire to improve that got him his chance; “He clearly worked hard over the summer to improve every area of his game and that’s translated onto the pitch. Arguably the crowning moment of Kane’s season came in the North London derby against Arsenal in February. Another two goals and a Man of the Match award in a 2-1 victory cemented his place in Tottenham folklore. Further doubles against West Bromwich Albion and Queens Park Rangers added to his tally with his second Spurs hat-trick coming in a 4-3 win against Leicester. Roy Hodgson was quick to take note and rewarded Kane with a call-up to the England senior team in March. The striker made an immediate impact coming off the bench to score England’s final goal in 4-0 rout in a European Championship Qualifier against Lithuania. It took all of 78 seconds for Kane to score and complete the dream debut in an England shirt. It will be interesting to see how he performs with the under 21’s at the European Championships this summer. It’s been an incredible season for Kane who has rivalled some of the world’s elite strikers, competing for the Premier League Golden Boot with Sergio Agüero and Diego Costa. Spurs were in need of a clinical striker and in Harry Kane they have gotten that and much more. He embodies the modern forward, he’s athletic, hard working, holds the ball up well, technically astute and he’s clinical in front of goal. This summer will be an important one for Pochettino, Kane and Spurs. Greg also offered some thoughts on what the summer could hold; “Spurs need to spend wisely over the summer and ensure their new signings will allow Kane to carry on developing and more importantly scoring goals. He’s set the bar very high for himself and maintaining that consistency will be key to continuing his development. This is a view that Ben agreed with; “Maintaining consistency is perhaps one of the more difficult traits for any player and only the very best are capable of doing so. Can he build on this incredible season and become one of the great, English strikers of the Premier League era? Final rating: 5/5 stars. He couldn’t have done anymore this season.